Is this where R2D2 frequents? Doubtful. R3 short for Restaurant 3 is one of the restaurants bragging about it’s local and organic fare. After reading Omnivore’s Dilemma, E* and I were eager anticipating a visit to any restaurant carrying Polyface Farm meat and produce. R3 is located in Arlington, VA. Loved the BREAD BOWL! It was a great variety with good butter. MM, Paula Deen would love, yes? Porkbelly Hoecakes (Braised Bacon, Pickled Slaw, Spicy BBQ $12) and Scallops & Grits (Asiago Grits, Tasso Ham, Tomatoes $13). Both appetizer were great. The pork belly was a bit salty but I guess that’s what you get with any form of pig. I REALLY liked the scallops and grits. I appreciate this combination with grits as I’ve never tried it before. I also thought presentation was attentive with plates and color arrangement of the foods. Ribs with corn on cob and mac&cheese and on the right is Pulled Pork sandwich with fries. This was a LOT of food, but not a surprise considering the people present–we all love food and wanted to try everything. 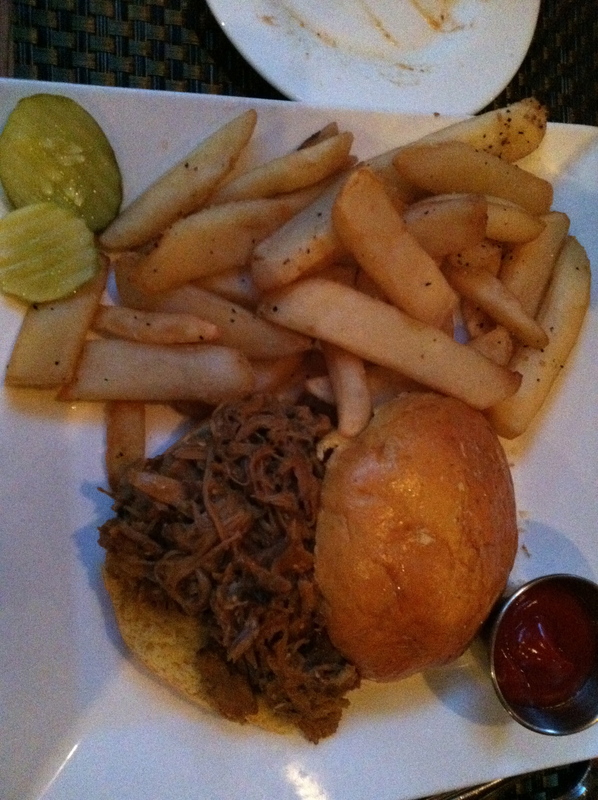 It was all pretty good, I don’t think I could finish the pulled pork sandwich and it was too sweet. The mac & cheese was GREAT, in all it’s wonderful gooeyness. Not a good picture, sorry! But this was some damn good pasta… the chicken is from Polyface Farm! 😀 It came with linguine, tasso ham, spinach, and cream at $19. Everyone at the table loved this dish. Too bad this was the only thing on the menu that really screamed Polyface Farm… everything else we had to ask the waitress about. And all she could say was “oh yeah, we get our stuff from all sorts of local areas”. ?? Okay…. maybe restaurant 3 needs to work on educating their wait staff on the sources of their food, and put it more eloquently. Ah, can’t forget dessert. Waffles with bacon ice cream and of course some coffee. Waffles were alright, definitely did not like the bacon ice cream. I would try it again somewhere else, as we all believed this one had CHUNKY bits of bacon. It should’ve been smaller. Instead of complimenting the ice cream, it stole the show. 😦 Anyway, I would love to have some chocolate covered bacon again mmmm mmmm good.